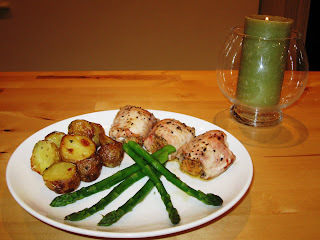 With this stuffed chicken I served steamed asparagus and roasted potatoes. - Flatten each thigh to 5-10 cm thick using a meat mallet. Note: I didn't do any frying to the chicken as I wanted to keep it as healthy as possible. If you would like to add more colour and a bit more flavour just fry the chicken a bit before putting it in the oven. Fry chicken pieces in a hot pan for a minute or two on each side (down side first to make sure it stays closed when turning over). The cooking time in the oven should be a little less in this case.